Sazerac CEO Mark Brown (MBA ’90) discussed the company’s growth into one of the top five spirits companies in the world as luncheon keynote speaker at the 2016 Tulane Business Forum. Mark Brown, president and CEO of the Sazerac Co., one of the world’s largest manufacturers of distilled spirits, doesn’t talk about his company very often. 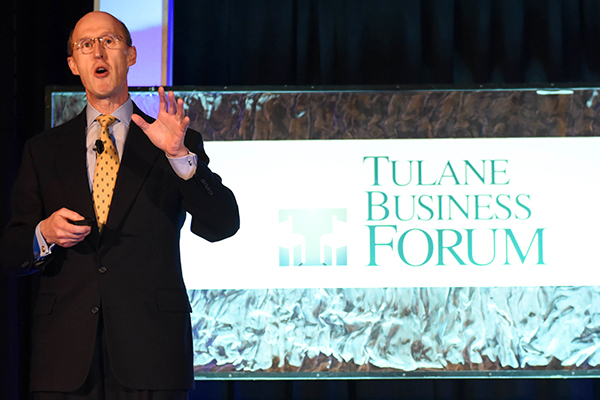 A 1990 MBA graduate of the Freeman School, Brown was the luncheon keynote speaker at the forum, an annual presentation of the Tulane Association of Business Alumni (TABA). With the theme “Purpose-Driven Business: How to Profit and Make a Difference,” the forum attracted more than 700 business people to the Ernest N. Morial Convention Center, making it the largest Tulane Business Forum in over a decade. Founded in 1850 and acquired by its current owners, the Goldring family of New Orleans, in 1948, the Sazerac Co. has grown dramatically in the last 25 years through a series of strategic acquisitions. With top-selling brands including Pappy Van Winkle, Fireball, Buffalo Trace and Southern Comfort, the Sazerac Co. is now the fifth largest spirits company in the world and the only U.S. manufacturer in the top five. Brown closed his talk by paying tribute to his Tulane professors, including current business school faculty members John Trapani and Frank Jaster. The forum also included presentations by David Altig, executive vice president and chief of research with the Federal Reserve Bank of Atlanta; Alan Leventhal, chairman and CEO of Beacon Capital Partners, the company developing the World Trade Center building in New Orleans into a Four Seasons Hotel and Residences; Shannon Schuyler, principal, chief purpose officer and corporate responsibility leader at PwC US; and Trey Fayard, founder and CEO of GLO, a locally based airline that provides nonstop flights to destinations across the Mid South.